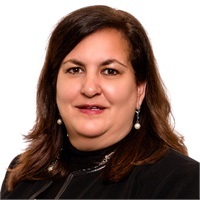 Marianne Rullo is a Portfolio Manager and Investment Committee Member at Meyer Capital Group who has been working in the financial services industry for more than 25 years. She is a specialist in reviewing portfolios and is passionate about communicating with her clients to help them feel financially secure. Before joining our firm, Marianne worked in several positions at Lehman Brothers and was a compliance auditor for the U.S. General Accounting Office. Her credentials include her a Masters in Business Administration from the University of Notre Dame, a Bachelor of Science in Finance from St. Joseph’s University, a Series 65 FINRA license and her Accredited Investment Fiduciary (AIF®) designation from Fiduciary 360, an organization which promotes a culture of fiduciary responsibility and improves the decision-making processes of investment fiduciaries. Away from work, Marianne likes to spend time with her family and friends, watching college football or visiting the park with Rocky, her Dogue de Bordeaux.